How can we talk about God today? The first answer is that we can talk about God because He has talked to us, so the first condition for speaking of God is listening to all that God himself has said. God has spoken to us! God is therefore not a distant hypothesis concerning the world’s origin; He is not a mathematical intelligence far from us. God takes an interest in us; He loves us; He has entered personally into the reality of our history; He has communicated himself, even to the point of taking flesh. A “War on Christmas” goes on in this and other countries. People are offended that even the mention of Christ’s birth is found in the public order. Great strides have been made to eliminate any specific, public references to Christ and His birth — no Nativity scenes, no reference to Christmas but tinsel, secularized songs, greenery, and various glittering things that refer to nothing really. Some allowance seems still to be made for Christmas music, both the religious and the sentimental kinds. Much of it is too beautiful to ignore. We ought to know, however, just what this Nativity that we call Christmas really means. The history of much modern “critical” thought has been designed to deny (a) that Jesus existed and (b) that scriptural accounts are credible. Christmas is judged to be a myth. The story of the Incarnation and birth of a god is the common stuff of many religions. Yet, with all this in mind, we are really rather astonished at the coherence of the Nativity account and what it means. The fact is that after centuries of trying to cast doubt on the reality of Christ’s Incarnation into this world, we must say that all the evidence, when carefully examined, indicates that Christ lived in a definite time and place. He was who He said He was. No other explanation suffices to account for the evidence. The effort to show that Christ was unreal or something else has failed. This article is from a chapter in The Reason for the Seasons. This fact does not mean that everyone will suddenly grant the truth of the Nativity event. For the most part, efforts to show that Christ did not exist or that reports of His life are unreliable were always grounded in the first place in a will not to believe the fact. This voluntary rejection is what led to the searches for reasons why Christ was not what He said He was. These searches sought to prove what the investigator wanted to be true. The truth of Christ’s reality did not have to be taken into account. Most people saw clearly that, if the accounts of Christ’s life and the understanding that He was indeed the Son of God now present in the history of this world were true, mankind would have to take this fact into its understanding of what man’s purpose was. And this is clearly the reason why You (God) first loved us so that we might love You — not because You needed our love, but because we could not be what You created us to be, except by loving you. In many ways and on various occasions you spoke to our fathers through the prophets. Now in these last days You have spoken to us in Your Son, Your Word. By Him the heavens were established, and all their powers came to be by the breath of His mouth. This Word was made flesh and has spoken to us. We are addressed in our rational being. We are asked to understand. We exist because of nothing in ourselves. We are a gift unto ourselves. We exist in abundance and astonishment. It is said that most people reject Christianity, not because they doubt the existence of an origin, of a God, but because of the claim that God, within His being, has an inner life. The only-begotten Son, the Image of the Father, becomes man. How could this be? Yet, if we look carefully at the explication of William of St. Thierry we see the answer. God did not have to create the heavens and the earth. Why did He do it then? In order that beings that were not God could also love God. And when it was clear that God’s plan for mankind was rejected by free men, God responded. Gently. The Father sent His Son to dwell amongst us. Where? He was born in Bethlehem of Judea. During the time of Caesar Augustus. In order that we might be able to achieve the purpose for which we were created. God will not coerce us. We have to choose to see the reality of what occurred. Why did this plan of God result in the Word becoming flesh? God might perhaps have redeemed us in some other way. But the way He chose was via the Nativity. A real Divine Person, now true God and true man, appeared amongst us so that we could freely respond to God’s love of us when we saw the consequences of our rejecting Him. Could God have done anything more than He did? Undoubtedly, no. It leaves us at the scene of the Nativity. What do we see there through the testimony of those who have passed on to us the account of Christ’s birth in the manger? We see Him through whom the world was created now entering this same world. The only sensible conclusion is that the world is simply not the same as it was before this event in Bethlehem. The history of the world changes at this point. Without understanding what happened here, we cannot understand ourselves. And this is what is happening to us as we remove all signs of the Nativity from our eyes and our souls. We find ourselves incapable of understanding ourselves. This is why the modern world is a world filled with human beings incapable of explaining themselves to themselves, but refusing to admit it. The name given to the Child at His Birth was Emmanuel, “God with us.” It is still the name that best tells us what, during the reign of Caesar Augustus, the Nativity was about. Editor’s note: This article is adapted from a chapter in Fr. 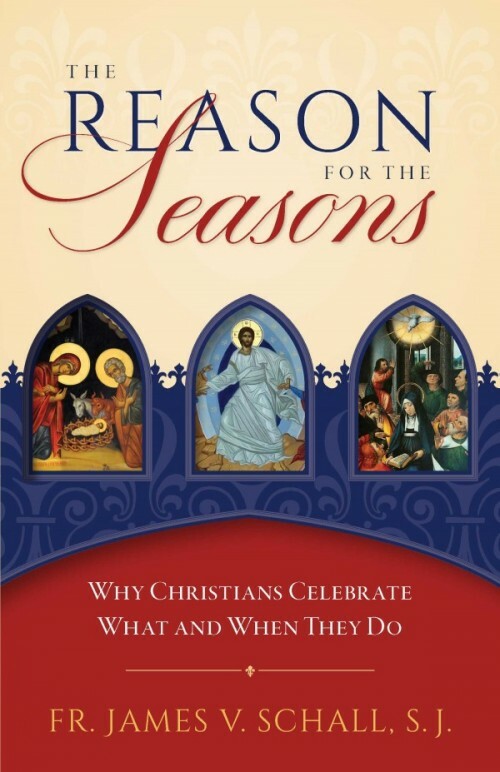 Schall’s The Reason for the Seasons, which is available from Sophia Institute Press. Rev. James V. Schall, S.J., taught political science at Georgetown University for many years. His latest books include The Mind That Is Catholic from Catholic University of America Press; Remembering Belloc from St. Augustine Press; and Reasonable Pleasures.